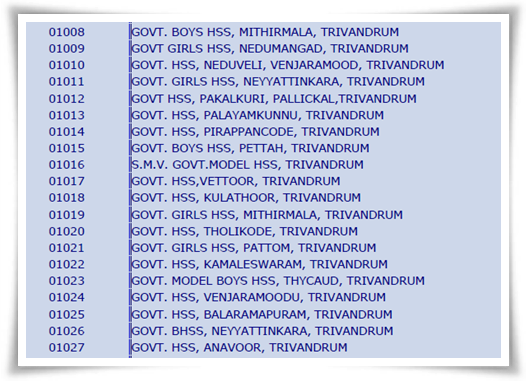 List of Kerala school names and school codes district wise details in PDF are given here. Kerala higher secondary school names and codes of High schools, HSE and SSLC for Thiruvananthapuram, Kollam, Pathanamthitta, Alappuzha, Kottayam, Idukki, Ernakulam, Thrissur, Palakkad, Kozhikkode, Malappuram, Wayanad, Kannur, Kasargod along with Arabian Gulf, Lakshadweep, Mahe are available for reference. Do you know the number of government schools in Kerala? Giving no time for more guessing, it is understood that, Kerala the pioneer in Education is hub of more than 13,000 schools only in the government sector. Other than having schools in 14 districts in Kerala, students from Arabian Gulf, Lakshadweep, Mahe follow the same mode of education as followed in the state. The quality of education and care well factor contribute for the development of too many schools in Kerala. According to the statistics, there are more than 43 lakh students studying from 1 – 12 in various schools only in the government sector. More than 6.7 lakh students are studying in various higher secondary schools. With an aim to provide social development and quality of life the state government and in particular the education department has come forward with innovative approaches to kindle the edification process. With the advent of the information technology, communication became so fast and effortless. To cater the needs and supporting the learning community, the education department of Kerala has set up various online portals. These websites provide updated information about government circulars and also announce results of millions of students. As notification of various examinations conducted by the education department are published through online portals, it is important for the students to get the various passwords to get more information. Especially during the time of results announcement, other than individual results, if the student need to get the complete list of results of his/her school, school code should be entered. To ease this process, the higher secondary education department has uploaded the school codes of 24 districts in Kerala and also those of Arabian Gulf, Lakshadweep, Mahe. Even though the school codes are provided in the DHSE Kerala website, it is much difficult to access the website during the time of high traffic. for more handiness we are providing the complete list of schools in Kerala along with School coded in PDF format. The School Codes can be used to get the results of Kerala SSLC, HSE,VHSE and other exams. Kerala DHSE Plus one (+1) results 2014 along with VHSE first year results will be published today (18th June). The Directorate of Higher Secondary Education (DHSE) Kerala will publish the result of the plus one first year examination held in March 2014. Candidates who had appeared for the exam can check their results through the official websites by giving their roll numbers. The Kerala DHSE (plus one) first year 2014 school wise result can also be checked through the website. Kerala DHSE plus one (+1) results 2014 has been published today (18th June). The Directorate of Higher Secondary Education (DHSE) Kerala has published the result of the plus one first year examination held in March 2014. Candidates who had appeared for the exam can check their results through the official websites by giving their roll numbers. The Kerala DHSE (plus one) first year 2014 school wise result can also be checked through online portal. Kerala HSE Plus one (+1) school wise results 2014 can be checked online by entering the school code in the official website. As the Directorate of Higher Secondary Education (DHSE) Kerala has published result of the plus one first year examination held in March 2014, students can check the school wise result through the official websites of the education department. Kerala Plus One 2014 Revaluation, Photocopy and Scrutiny application forms are available for download. Application forms of Revaluation, Scrutiny or Photocopy must be filled and shall be submitted to the Principals concerned along with the required fee and copy of the mark list before 30th June. The revaluation fee for each paper is fixed at Rs 500, Photocopy Rs 300 and Scrutiny Rs 100. Kerala 2014 HSE Plus One (+1) Say/ Improvement time table has been published. The 2014 Higher Secondary/Technical Higher Secondary/Art Higher Secondary First Year Improvement / Supplementary exam will be held in August 2014. The examination will be conducted in all the Examination centers in Kerala and Lakshadweep and in the selected centre in the Gulf countries.